Art is the only revolutionary energy, in other words the situation will only be changed by human creativity." Websites: Click on the green text to take you to the website. Rebates for rainwater cisterns and other water saving devices available through Monterey Peninsula Water Management District...while funds last. The Monterey County Business Council has an informative brochure on grey water and rainwater catchment here. For information on native plants and supporting native habitats go to the California Native Plant Society webpage. The mission of the Carmel River Steelhead Association is to restore, conserve, and protect the Steelhead Habitat of the Carmel River Watershed. The primary mission of the Carmel River Watershed Conservancy (CRWC) is protection of the natural resources (including threatened species of steelhead and California red-legged frogs) that form the Carmel River Watershed. To preserve, protect and defend the beauty and natural resources of the Carmel River Watershed go to the Carmel Valley Association. Center for Humans and Nature: Our projects develop ethical ideas related to some of today’s most pressing issues. Our projects bring together some of the best minds to think creatively about humanity and our responsibilities to each other and the biosphere. Chris Jordan is an internationally acclaimed artist and cultural activist. (Link takes you to a powerful TED talk he gave in Monterey in 2008.) His images explore contemporary mass culture from a variety of photographic and conceptual perspectives, connecting the viewer viscerally to the enormity and power of humanity’s collective unconscious. Edge-walking the lines between art and activism, beauty and horror, abstraction and representation, the near and the far, the visible and the invisible, his haunting works ask us to look both inward and outward at the traumatized landscape of our collective choices. He is currently working on the film Midway about MIdway Island that is inundated with plastics. It is these plastics that the albatross bird population eats thinking it is food but they die a painful death. Divine Water documentary. Our charity, Healing Water Institute, is making a full length, theatrical standard documentary film on vitally important, little understood fascinating aspects of water, and at the same time is calling for a new culture that takes water as the paradigm to learn from. For comprehensive information on birds of Monterey County and beyond go to Don Roberson's website. John Todd Ecological Design: The Eco-Machine™ is a beautiful water garden that can be designed to provide advanced treatment. The Eco-Machine functions similarly to a facultative pond with both aerobic and anoxic treatment zones, only instead of a body of water, the process occurs within individual tanks, creating independent treatment zones. The Endangered Species Print Project offers limited-edition art prints of critically endangered species. The number of prints available corresponds with the remaining animal or plant populations. ESPP is a project by artists Molly Schafer and Jenny Kendler. Gardening With a Wild Heart, planting with California native plants. Geography of Hope: the value of The Wild, from the writings of Wallace Stegner. The mission of Keepers of the Waters is to inspire and promote projects that combine art, science and community involvement to restore, preserve and remediate water sources. Keepers is at the vanguard of integrated approaches to a vast complexity of water issues through collaborative innovative design, community organizing, mentoring, educating, providing workshops, and functioning as a cross cultural resource. Dirt! The Movie is an insightful and timely film that tells the story of the glorious and unappreciated material beneath our feet. Inspired by William Bryant Logan’s acclaimed book Dirt: The Ecstatic Skin of the Earth, Dirt! The Movie takes a humorous and substantial look into the history and current state of the living organic matter that we come from and will later return to. Dirt! The Movie will make you want to get dirty! Go to this new video Liquid Assets: Protecting our Creeks, Streams and Rivers by Lois Robin to learn what constitutes a healthy river and watershed and how you can help support such healthy habitat. For residents in Monterey County you can get a similar watershed guide to help you in restoration and preservation of habitat by going to the Resource Conservation District for Monterey County website. The mission of the New Economics Institute is to conceive, create, communicate, and catalyze new economic theories and practices toward a just and sustainable world. We uniquely combine vision, theory, action, and communication to effect a transition to a new economy—an economy that gives priority to supporting human well-being and Earth’s natural systems. Occidental Arts and Ecology Center (OAEC) is a nonprofit organization and education center and organic farm in Northern California’s Sonoma County. OAEC was founded in 1994 by a group of biologists, horticulturists, educators, activists, and artists seeking innovative and practical approaches to the pressing environmental and economic crises of our day. You can also learn about the WATER Institute here. Watershed Advocacy, Training, Education, & Research promotes understanding of the importance of healthy watersheds to healthy communities. Orion Magazine: Orion’s mission is to inform, inspire, and engage individuals and grassroots organizations in becoming a significant cultural force for healing nature and community. Orion is partnering with Living on Earth radio program to air essays from listeners and writers (you!) on the new program The Place Where You Live. You can also submit your essay to Orion for their print and/or digital version of The Place Where You Live. To see more of Pamela Takigawa's art click here. To see more of Paola Berthoin's art click here. Planetary Collective is a group of filmmakers, visual media creatives and thinkers who work with cosmologists, ecologists, and philosophers to explore some of the big questions facing our planet at this time. Embracing a multidisciplinary, multi-media approach, we brings scientists, philosophers, and researchers together with designers, coders, and creatives to bring new perspectives to audiences around the world in fresh and innovative ways. Check out the first short film, Overview, on how astronauts are bringing the message home about The Planet we all depend on. Queen of the Sun documentary: With the coming of spring, we’re reminded of our sacred relationship with honeybees that so many ancient civilizations recognized. Whether it’s mason bees or honeybees, millions of beings are assisting us as we strive to improve our world. Much like the Egyptians and the Mayans before us, we give thanks in our own way supporting nature and planting flowers or simply putting up a solitary bee hive or a clean basin of water. Regenesis is a pioneer in the field of Regenerative Development -- partnering people and their place to regenerate ecosystems, economies, and the human spirit. Regenerative Development starts from a radically different perspective -- human environments and activities can and should be engines of positive evolutionary change for all living systems. The path begins with Place. Check out their Story of Place approach to human development that creates with the land's need for preservation of ecological integrity. The Regenerative Design Institute (RDI) is a non-profit educational organization with the vision that all people can live in a mutually enhancing relationship with the earth. We envision a world in which people, inspired by nature, create and maintain healthy and abundant livelihoods that enhance fertility and biodiversity on the planet. Return of the Natives Restoration Project: RON's environmental goal is to protect the waters of the Monterey Bay through restoration of the waterways and the lands draining in the Bay. RON's social goal is to bring people and nature together on restoration and garden projects in the watersheds of the Monterey Bay from the Monterey Peninsula to North Monterey County and from Salinas to San Ardo. 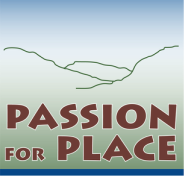 RisingLeaf Watershed Arts The genesis of Passion for Place and where the ideas of Watershed Arts began in the Carmel Valley community in 2001. Spring of Sustainability is an annual series on the web where you can learn from and be inspired by the world’s top pioneers of sustainability. These free sessions offer practical and personal insights that have a global impact, as tens of thousands of people like you join with us to bring forth a thriving new world! our spectacular wildlands, trapped our amazing wild animals in habitats too small and offer no way out. But TrekWest adventurer John Davis believes, if we learn to work together now, we can save what we love before it’s too late. Follow his 10-month, human-powered journey along a visioned Western Wildway, running from Mexico to Alaska. Experience life on the wild side. And join a growing Wildlands Network of heroes, committed to connecting and protecting safe pathways for wildlife and creating healthier communities in the West. Wendell Berry This link is to a conversation Wendell Berry had with Diane Rehm. (The Diane Rehm Show) Berry's nonfiction serves as an extended conversation about the life he values. According to him, the good life includes sustainable agriculture, appropriate technologies, healthy rural communities, connection to place,the pleasures of good food, husbandry, good work, local economics, the miracle of life, fidelity, frugality, reverence, and the interconnectedness of life.